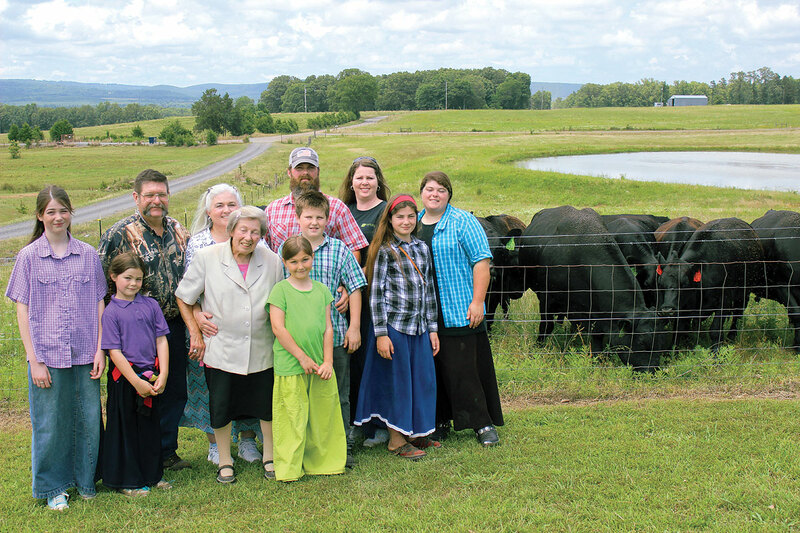 Following a lifelong dream to farm, newlyweds Billy and Susan Brewster moved to a rough timber farm in Wilburn, Ark., in 1975. Forty-two years, three children and 10 grandchildren later, they are still farming and still learning. Billy’s parents had purchased the 320-acre farm with the hopes of retiring there someday. 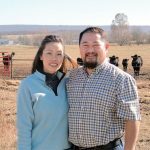 With a combination of pioneer spirit and a desire to produce quality sustainable farm products ranging from registered Angus grass fed beef, fresh garden vegetables and honey, the Brewsters have garnered the respect of their peers in Cleburne County and were selected as the 2017 Farm Family of the Year. On the Triangle Anchor Ranch the Brewsters currently have 50 head of registered Angus cows, seven dairy cows and 20 Nubian goats. As part of their sustainable agriculture commitment, the Brewsters use intense grazing practices for their cattle from start to finish. 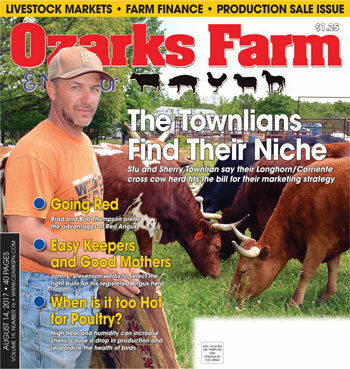 Pastures are laid off in 10-acre fields with 50-foot lanes that have gates in all corners. The cattle are rotated every two days. Fertilization is provided by a large compost pile from their vegetable garden and dairy manure. A mobile chicken pen is used to fertilize the garden in the off season. The goal is to keep all areas covered with vegetation. One large pond and several small ponds have been constructed on the farm to catch runoff. Field stones have been utilized to make crossings through the runoff areas to avoid rutting pastures. Seven year ago, Billy designed and constructed a solar well-house that takes cattle watering completely “off the grid”. The well is 200-feet deep and runs off an AC/DC flexible voltage pump. Underground pipe carries the water to water tanks that sit on gravel with fabric underneath to eliminate erosion and mud pits around the tanks. The Brewsters have three grown children, two of which, Isaac and Carrie, live and work on the farm. Isaac and his wife Shirley have five children who are all active in working on the farm. They have a small herd of cattle, they have started raising bees, and their children are active in 4-H. Youngest daughter Carrie keeps busy managing the dairy cows, making cheese, working in the garden, and raising registered Bloodhound and pocket Beagles. 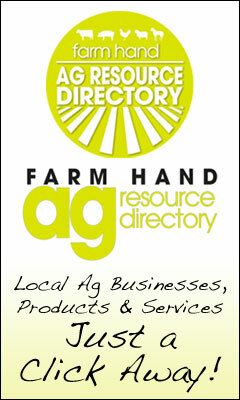 Carrie is also the public relations guru for the farm. 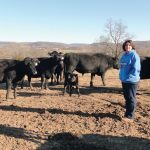 She manages the farm’s website, prints flyers to promote the farm’s beef sales. As busy as the farm life is for the Brewsters, they all find time to contribute to their community. Billy has been on the board of several community and church organizations. 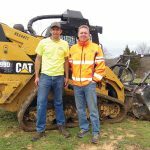 He started the Baptist Church of the Wildwood in Wilburn in 2008 and serves as pastor. Billy drives a bus for 4-H activities and organizes fundraisers for young people’s mission trips. Susan Brewster manages to stay busy in her own right. She substituted in the Wilburn School system before it consolidated with Heber Springs, taught at Cleburne County Christian school, operated a rabbitry of 100-plus New Zealand white does, participates in the Cleburne County Fair and helps with 4-H. Susan currently teaches in the Homeschool program at the Baptist Church of the Wildwood.